Is anything more important than quality? We don't think so. That's why we incorporate multiple quality safeguards involving multiple staff throughout the machining process. We utilize ISO‑compliant processes and procedures with the ultimate goal of delivering on time, within tolerances, per your print. We have built our business on quality, flexibility, and delivery. 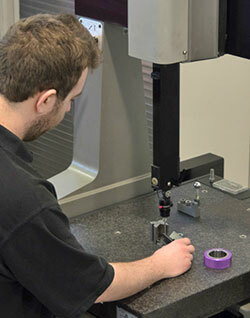 Our quality safeguards ensure the parts we manufacture are dimensionally correct and always fully traceable. Our goal is to continue to offer top quality, flexibility, and on-time delivery to our customers. We strive to develop a working relationship with each customer to insure we meet their individual requirements and needs. We invite you to visit and tour our machining facility to see these practices in person. Contact us today to schedule a visit.